This is to inform all youth and parent that the Jss 1 NIGERIAN NAVY SECONDARY SCHOOLS ADMISSION SUPPLEMENTARY LIST is out and we are advices to make use of this opportunity before is too late. follow the appropriate procedure of applying for the supplementary list for admission into jss 1 in Nigerian navy secondary schools for 2015/2016 that was just relies. A non-refundable deposit of N29,000 in bank draft in favour of The Directorate of Naval Education, Moloney Lagos for books and other items. Proof of parental status (for Military personnel only). Collect, fill and return acceptance forms to the school. boarding house requirements (for boarding students only). Please note that this offer of provisional admission will lapse and be passed on to a candidate on the waiting list if not accepted by 14 August 2015. I’M MR, ISAAC ROTIMI JIMOH FROM KOGI STATE,I NEED ADMISSION FOR MY SON INTO NAVY SECONDARY 2016/2017 ACADEMIC YEAR.PLS DO ALERT ME WHEN D FORM IS OUT. Hello sir/ma ,I’m mrs ogunyemi I need admission for my son in to Nigerian navy secondary school ogbomoso 2016/2017 academy year , pls let me know when d form is out. Plsss sir, am cadet kings of Maritime Academy of Nigeria, I will love my junior brother to be in this navy school, please alert me on the admission form 2016/2017 academic session.tanks, I base in portharcourt. @cadet kings, Ok. we shall do that. But also try your best to coming around our blog for latest updates and other interesting topic. 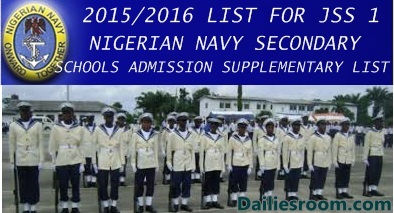 sir is it possible to get my son in jss 2 transfer in to Nigeria Navy secondary school ? Sir is it possible for me to get transfer for my son in jss2 into Nigeria Navy Secondary ? Pls when is admission list 2016/17 for NNSS Ogbomoso going to be released/published?